I have been spending some time recently talking with leaders, picking their brains a bit. Because I’m a firm believer that good leadership is good leadership regardless of industry, I haven’t limited these conversations to educational leaders only. A couple of weeks ago, I had the privilege of speaking with Mark Ackley, Executive Vice President of Nueterra Capital. We were discussing the ways leadership has changed throughout our careers. His passion for relational leadership echoes my own, so I couldn’t help but spend time pondering his thoughts as they related to my own experiences. My professional experiences all take place in the education arena. I have worked with both types of leaders. The “traditional” boss wanted people to feel like they had input, but we really had very little. He very much wanted to be the “smartest guy in the room”. This led to a disjointed team, that he ran through fear rather than a collaborative spirit. High turnover in that administrative team comes with no surprise. Other leaders I’ve worked with are more evolved in their leadership styles. They seek ways to build their teams, show their employees that they are valued and an important part of the organization. These are the leaders I want to learn from. They are the ones I want to work with. 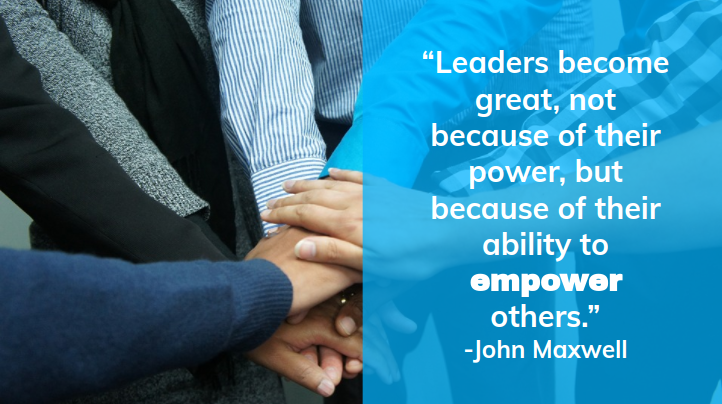 How do you empower your team? I’d love to hear your leadership stories.